Our lovely new Fabric Storage Boxes are well wrapped with handmade gift wrapping paper and are completely multi-functional. Our Paper Boxes are soft enough to delicately store you precious clothing and accessories in the bedroom and beautifully add extra storage in your living room. Our Handmade Boxes are Handcrafted and made from Recycled Paper and Recycled Board. Paper Boxes comes in sturdy packaging, Gift Box can also be packed in Nested Packaging where the small boxes gets nested in the large size Paper Box. Our Paper Boxes are available in variety of sizes and prints. Their sturdy cardboard frame is covered in soft, fashionable fabric or recycled paper so that you can select between wide range of printed wrapping paper that effortlessly match every decor. 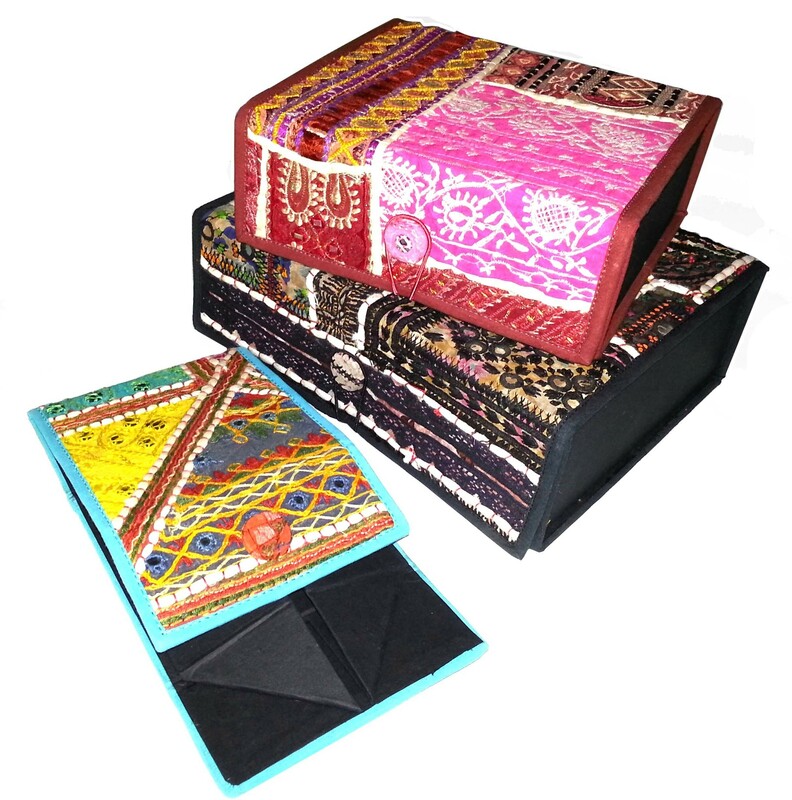 We are exporter and manufacturer of all kinds of Handmade Gift Boxes in various sizes. Gift Boxes are used to pack Gifts for loved ones. The Gift Paper Box is made from Printed Wrapping Paper and other types of Eco Friendly Materials. We are also making Paper Jewelry Boxes made from hardboard and paper. Handmade Gift Box may be used for Gift Packaging and we are manufacturing Paper Box using premium quality materials and give is a superior attractive look. Our Recycled Paper Boxes may come in 3 sizes to select those that best match your stylish storage needs, and our Gift Boxes are easy to assemble in seconds and easily fold flat when not in use for easy storage. Our Paper Boxes are available in different sizes, and patterns. Handmade Gift Box is basically used to hold Gift for many Corporate Occasions, Diwali Decorations, Christmas Decorations and other Seasonal Decorations. Not only our Boxes are made from Handmade Paper but we can also make them in Recycled Kanta Fabric. These boxes are covered with Kanta Fabric which is again Hand Done. Gift Boxes are made from recycled materials and are completely environmentally friendly. Gift boxes can come customized shapes and sizes. Our factory is completely Fair Trade and Sedex Certified. We are selling all these products specially Handmade Paper Online. Just in small span of time we have achieved the benchmark in selling Bulk Handmade Paper also along with Paper Craft Supplies we are leading exporter of Paper Craft Supplies. This has all become all alive due to our Attractive Wrapping Paper, our design team dedicatedly works on developing Handmade Wrapping Paper in India. We are manufacturers and exporters of all kinds Handmade Paper Products like Paper Baskets, Paper Trays, Fabric Trays, Fabric Baskets and more. We can use different varieties of fabric like Kanta Fabric, Khambadia Fabric and Block Printed Fabric. All items are Fair Trade and Sedex Certified. The range of our products are building very vast and wide. We have been producing a large range and variety of Paper Journals, Paper Notebooks incorporated with Leather Notebook, Leather Handmade Journals and many other Handmade Paper related Products. Our company is extensively working on exporting our large range of Decorative Printer Paper.. That is why we are leading supplier in Paper Decoration, Handmade Decorations, Christmas Decoration, Christmas Tree Decorations and all types of Paper Ornaments.